A nice to do knit, no great thinking yet not mindlessly tiresome, from Debbie Bliss' The Knitter's Year enjoyed as much as the first time I used the pattern last autumn here. This time knitted in Rico essentials soft merino aran in sage. And it really does look sage-y so please forgive the photography. The fact that it is indeed sage is why I used a pretty gentle pink velvet ribbon for the bow. Sage green and pink together... dreamy. I have more wintery knits to share, maybe before summer! Another easy to do knit, this time knitted in Debbie Bliss cashmerino aran in grey. Delightful, soft wool and a very gentle knit... I love the ribbing at the top. Carrying on with the giving of a literary hottie, I wrapped this up with some books and thought how sweet it would be to have a pocket for a book on the front. I decided to follow the pattern though because really it is far better to have a pocket in which to keep ones hands warm than heat a paperback. 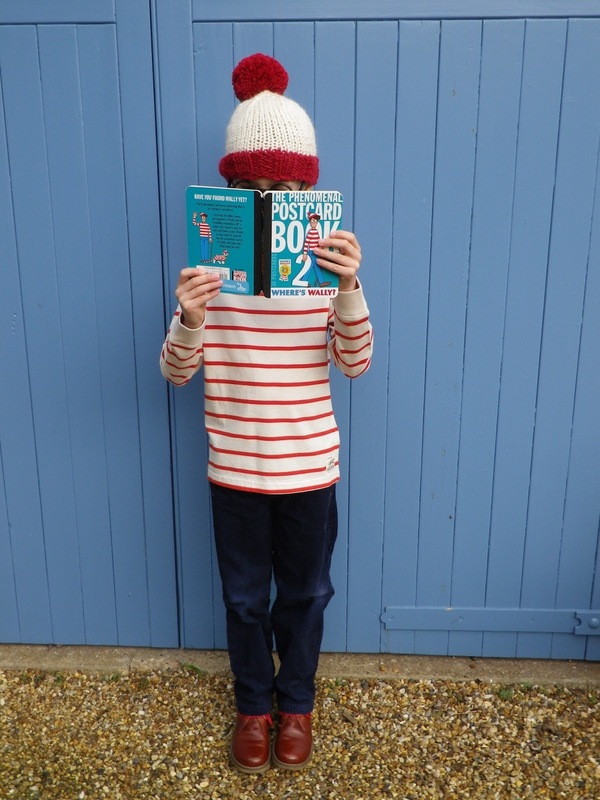 Hope you have been enjoying your cosy bedtime reading, Weens! 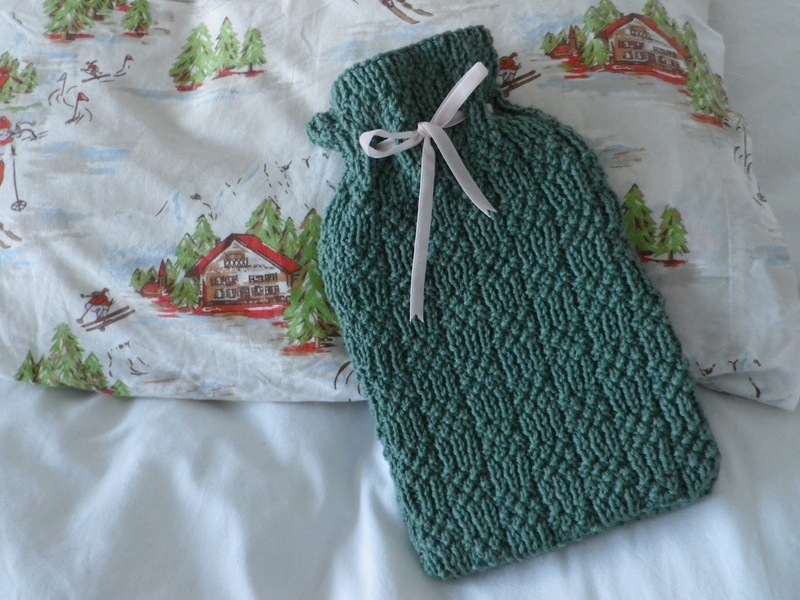 I love the idea of giving a hot water bottle, beautifully matched to some bedtime reading, an idea found in Jane Brocket's The Gentle Art of Knitting. 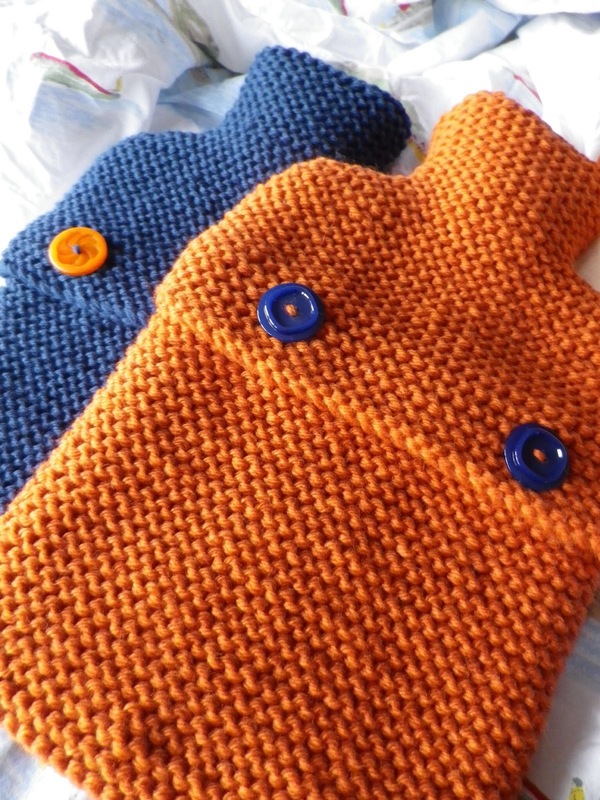 These are knitted in Cascade 220, a dream to knit with, in colours Harvest and Atlantic. 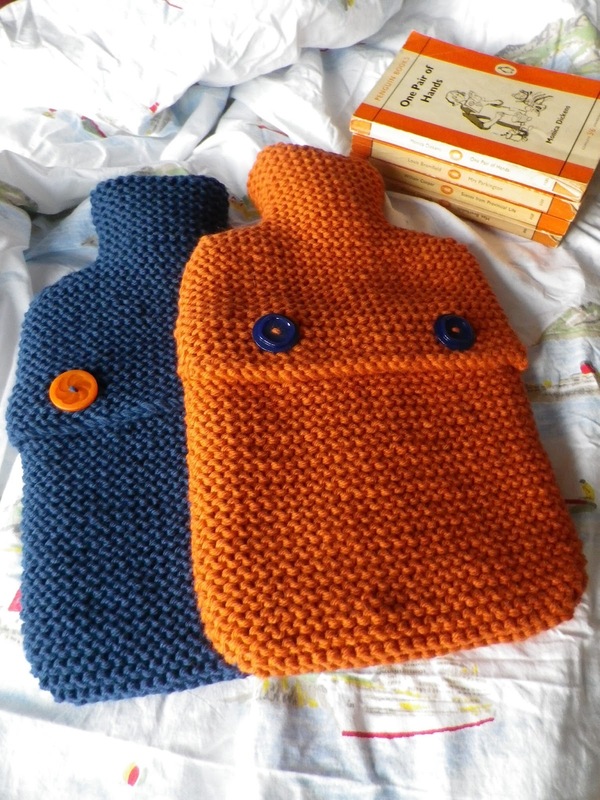 I did find the funnel part of the pattern a little too long, but maybe this was just these hot water bottles. The fit everywhere else was nicely snug, and I ended up just tucking the extra in at the top. 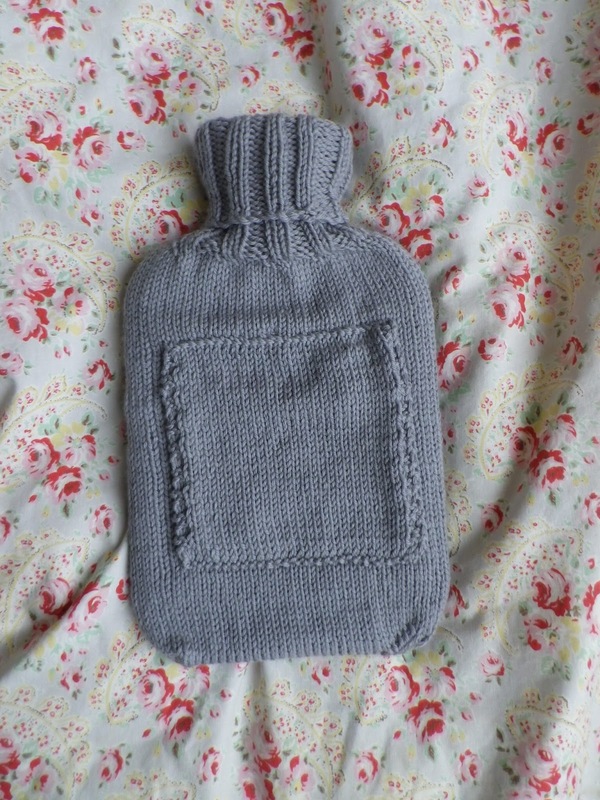 Next time I would knit a few less rows for this part, and maybe measure it against the hot water bottle rather than merrily knitting the pattern. 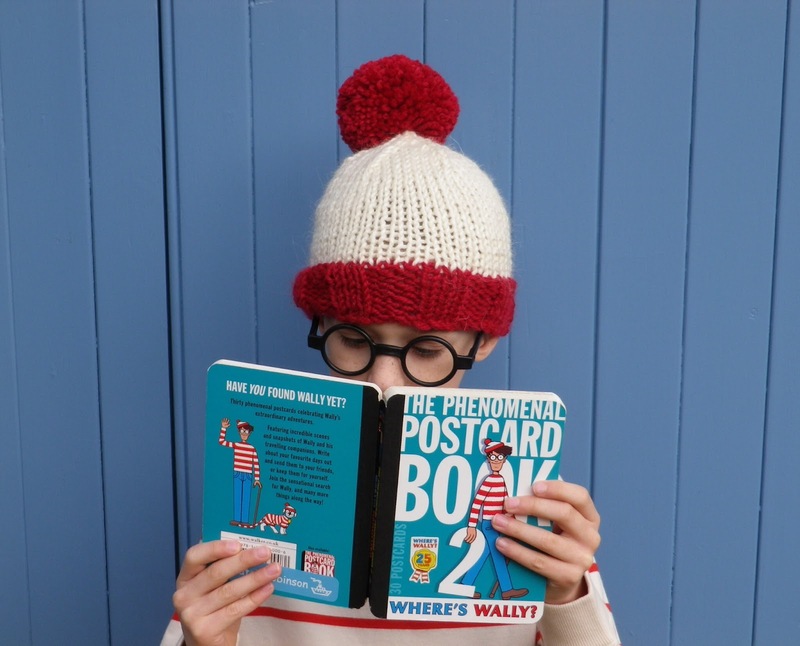 Do hope you are enjoying some snug bedtime reading Linda and Ems! Oh my, I wasn't sure I had it in me but this hat remains without pom-pom and for that I think Mr R is perhaps rather grateful. 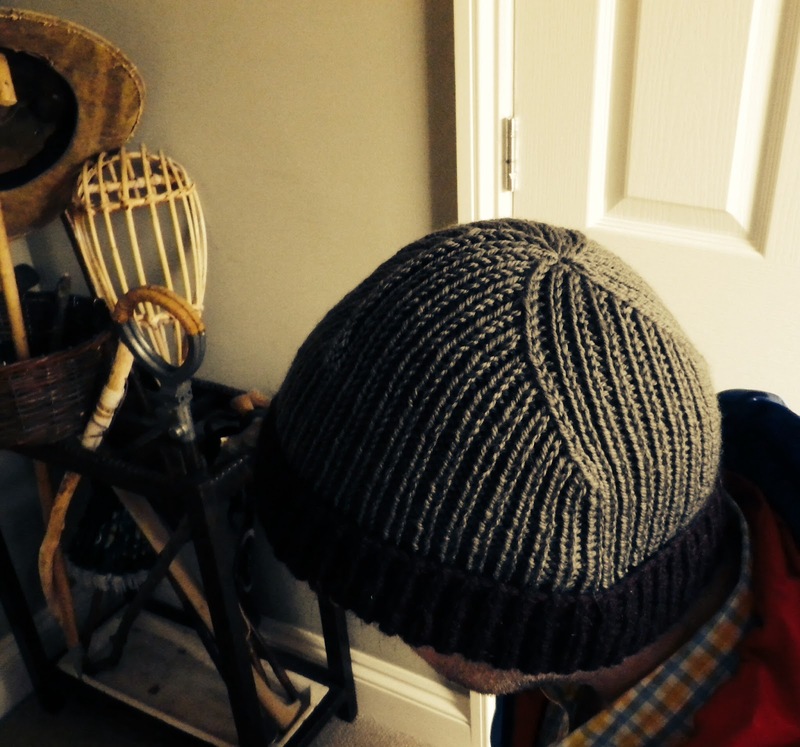 This time I knitted the twisted rib beanie from Jenny Lord's Purls of Wisdom, using Rico fashion country aran in aubergine and Rico essentials soft merino aran in mouse grey. I prefer the merino aran, the aubergine is just a bit sheddy and scratchy. I followed the suggested adaption to make the beanie into a fisherman style... that is I added extra rows so the contrast could be turned up. And I do like those twisted ribs. 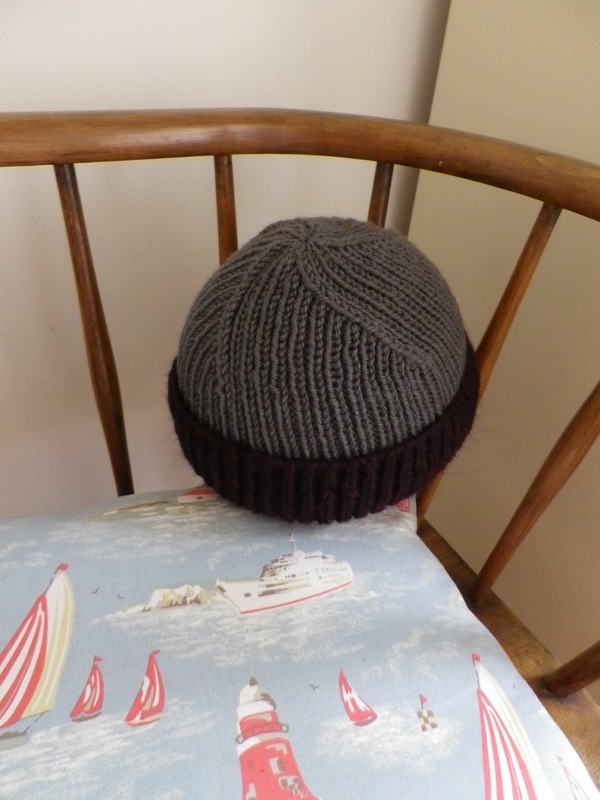 My attempts at photographing this hat without a head just didn't show those nice twists, and you may wonder why the hat is squashed into the corner of the chair, propped up with a cushion. Well, I found that in the absence of a head a balloon makes for an adequate substitute. This probably isn't true for all situations where a head is normally required, but for modelling woolly makes it really is fine. Here is the photograph I have including a head, but with the general gloominess it is rather dark!